We’ve partnered with companies that give our loyal alumni discounts and perks. For our referrals, we receive compensation and it benefits UND alumni by keeping you engaged with your alma mater through events throughout the nation and the Alumni Review in your mailbox. Taking advantage of these benefits is a win-win. Get insured! The Alumni Association & Foundation and Liberty Mutual have teamed up to offer a special discount program to UND Alumni. As a UND graduate, you can get discounts through Liberty Mutual on high-quality auto, home and renters insurance. See for yourself how much money you can save by getting a free, no obligation quote. Carry your UND Pride with you wherever you go! The Alumni Association & Foundation and US Bank have partnered to offer a Visa credit and debit card to alumni. The UND Visa card offers great rewards points and APR. Every card opened and used helps support alumni programs. When you shop on AmazonSmile, Amazon will donate 0.5% of the price of your eligible purchases to The University of North Dakota through the UND Foundation. Shop here to support UND's students and faculty! 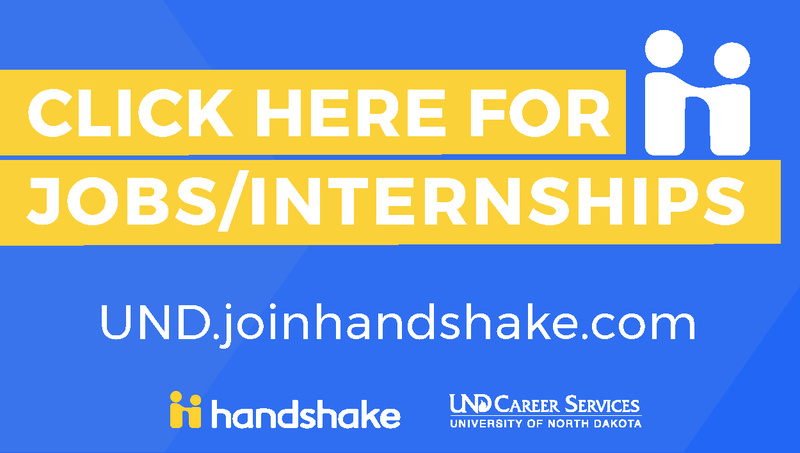 To start your job search, go to UND.joinhandshake.com. Choose “Sign up for an Account” under the yellow Handshake logo on the left and select “Alumni” to get your profile set up. Visit the UND Alumni LinkedIn page to network with other UND grads and view other employment opportunities. Please post part-time, full-time and internship positions on Handshake. Choose “Sign up for an Account” under the yellow Handshake logo on the left. It will walk you through the process of setting up your profile. If you have any questions, please contact the UND Career Services office at 701.777.3904 or UND.careerservices@UND.edu. Thank you for thinking of UND students and alumni for your hiring needs! The UND Alumni Association & Foundation also gives you the opportunity to directly target specific prospects via mail or email. Send a direct mailing or email to UND alumni targeted by discipline, class year, location, or other qualifications. Your job opening of about 500 words or less will be mailed or emailed to alumni, and your company’s logo can be included. We will send the letter and mailing addresses to a third party vendor for printing and mailing. You can email your request for either a mailing or an eblast to webmaster@UNDalumni.net. We will reply back with a request for content, graphics and demographic for the mailing or email within 2 business days.